We’ve been working diligently to review our costs and increase our productivity to avoid pricing changes for the last two years, but the truth is we should have raised prices a long time ago. We’ve found that selling more kombucha at the same price just isn’t enough to cover inflation and the increased overhead we’ve incurred with our growth. We can no longer continue to organically grow our business just by working harder. Rent, insurance, payroll, utilities, raw materials, equipment…every cost associated with running our business has skyrocketed as we’ve grown, and the increase goes beyond what we can absorb. We won’t compromise quality or community. Sure, there are ways to cut costs. Buy tea that’s not organic. Pay your employees less. Stop supporting local farmers by purchasing their produce for flavoring. Streamline our offerings to just a few flavors. Limit hours of operation. Augment the brewing process to speed it up. But that’s not how we do things. Beginning January 1st, 2019, prices will increase on the majority of our products because it is important to us to be able to continue to offer the quality, availability, and service our customers deserve. 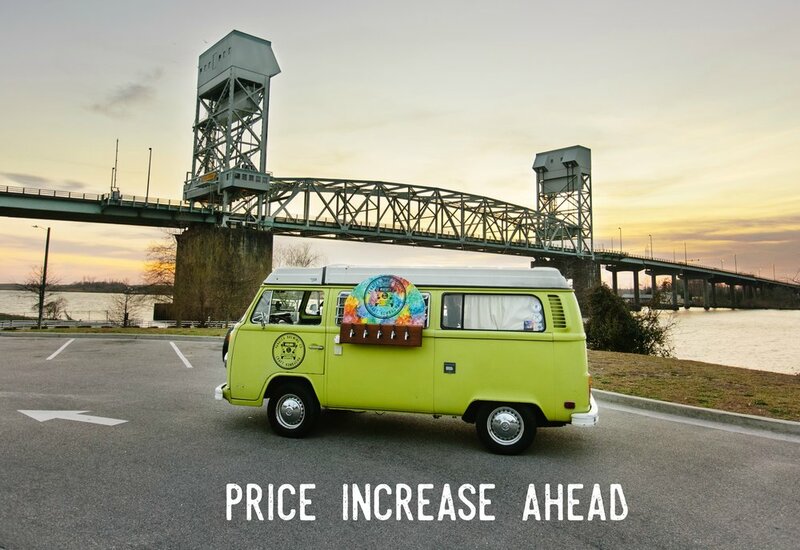 While price increases are rarely welcomed by the producer or the consumer, we are thankful to still be able to offer our craft kombucha at a price below both the national and state average even with the increase. We’re thankful for your continued patronage and appreciate your loyal support as we keep working hard to expand our grassroots family business. With your support, our business will continue to grow in 2019. Thank you! Phew, it’s been a crazy 2018! In fact, the entire past 2 1/2 years seem like a bit of a blur to us; it seems like we’ve been running trying to catch up with this business ever since we launched. This community has been so good to us, allowing us to grow beyond our expectations, and for that we are supremely grateful. Here’s a look at where we’re headed in the next year and where we’ve come from. Buckle Up! We’re launching our single use kombucha bottles to wholesalers. This means you could potentially get Panacea Kombucha just about ANYWHERE in New Hanover, Pender, and Brunswick Counties. Wait till you see the fab bottle design by local Wilmington experts Ebbing Branding and Design. We’re debuting our alcoholic products. That’s right, we got our federal brewing license this year and are working on recipes right now. Local kombucha beer on the way! We’re moving our taproom! YES, more space, more taps, more fun coming your way! Where? Well, that’s a bit of a puzzle at the moment, but we’ll let you know as soon as we know! Panacea launched from the Burgaw Incubator Kitchen with an opening brewing capacity of 20 gallons in August 2016. In 2017 we rented a small commercial space to expand our brewing capacity and we worked farmers markets 6 days a week through fall. In October 2017 we opened the doors to our tiny taproom. Our brewing capacity increased from 340 gallons to 1400 gallons. In 2018 we grew our team from 2 to 7 employees and moved into our new production brewery which has allowed us to increase our capacity to 2600 gallons. We’re so glad you’re along for the ride! Thanks for an amazing year!